We knew exactly what we were getting ourselves into… And we knew it would be miserable. The weatherman said the weather would be in the upper 80’s with 90+ percent humidity. 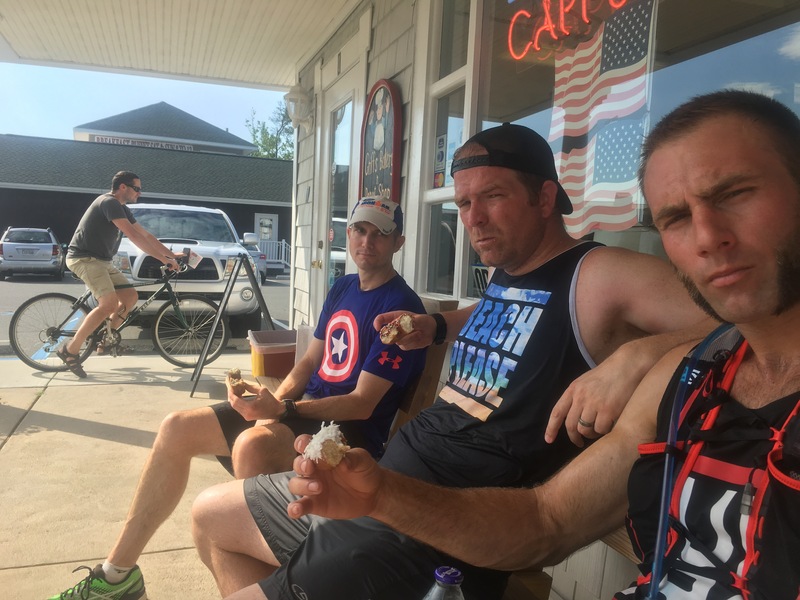 However, they say misery loves company and so when Brian found out Gabe and I were planning to run the 35 miles from Lewes, Delaware to The bottom of Ocean City he was eager to jump on board…. 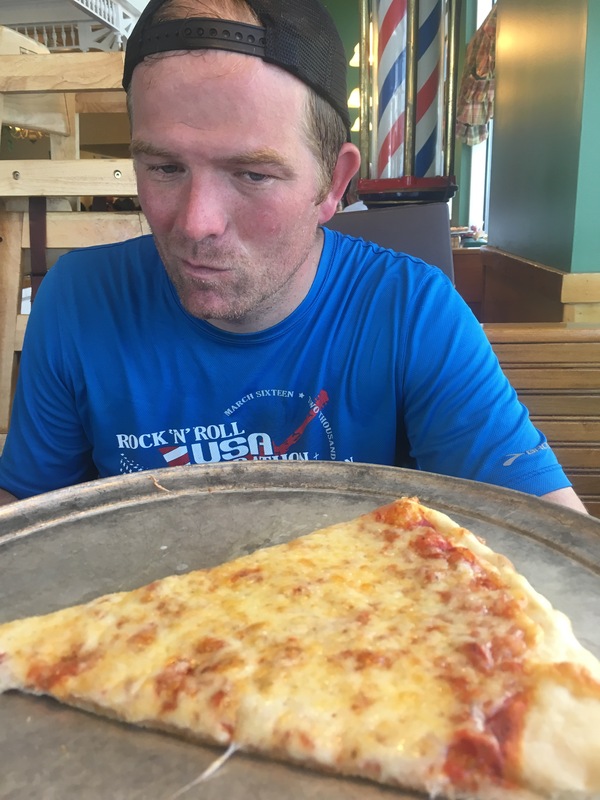 Well until he discovered that we planned to eat a few meals on the way, as we ran, and that the other runners would choose what you would eat. Then he was less eager…. but nevertheless he was still meeting us. “Yeah, but Trent… I thought it would be interesting to add a food element to the run” – Yeah it would be interesting. I pulled up to around where the 26th mile of our trip would be. Brian was there waiting and Gabe was on his way. Gabe picked us up at 4am and we drove to Lewes where we dropped off his truck and scrambled to find where the beach was located. It wasn’t easy with sleep-deprived minds and an eagerness to get running. We passed through several beach campsites before finally making our way to the beach. There was no fanfare and no real excitement to start. We just started running on the sand. We ran maybe a mile or two before seeing the lookout area that connected to Gordon Pond Trail and a glow of red began to appear over the ocean. The sun was slowing coming up, but we still had a good hour of darkness to run in as we entered Gordon Pond Trail. Gordon Pond Trail is part of both of the Marathons in the Lewes/Rehoboth area and it is one of the most beautiful places to run on Delmarva. There are lots of wildlife, beautiful vistas and a soft crushed gravel to run on. The trail took us very close to The Rehoboth Beach Boardwalk. The boardwalk was already the fourth different terrain we had run on in just a matter of a few hours. It was now light and there were people jogging, riding their bikes and walking their dogs. We did what seemed natural as we ran, we kicked a small ball back and forth for a few miles and threw on random articles of clothing people left on the beach. We then went back on the sand and headed south towards Dewey Beach. There were roads in between but we stuck mostly to the sand and by the time we arrived at Dewey Beach we had run 8.5 miles and we were ready for a food challenge. Since it was Gabe’s idea, he went first in choosing what we would eat. And what did he choose? 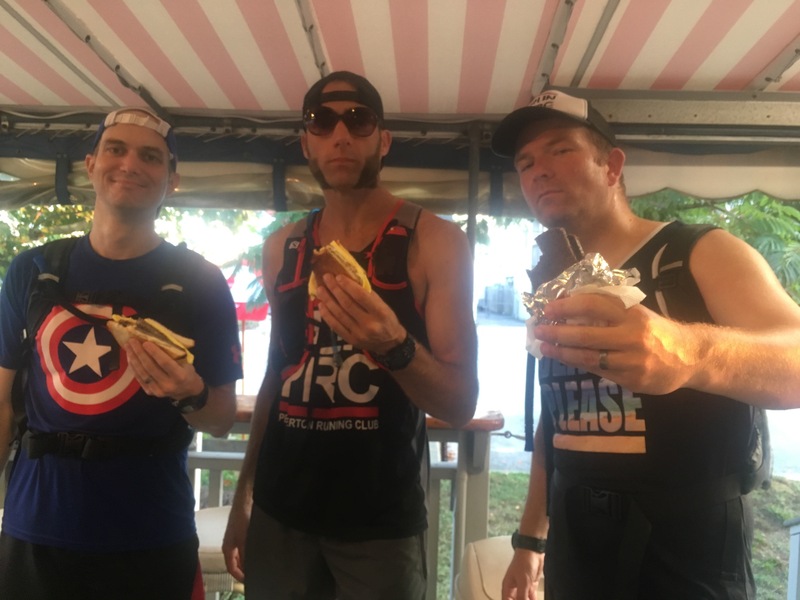 Yeah with 8.5 miles in with 26.5 miles to go we stopped at Sharky’s Grill and ordered three scrapple sandwiches and began to eat. I failed to mention to both Brian and Gabe that I hate Scrapple. I find it disgusting. It took me forever to eat the sandwich, opting to eat half of it as I ran. That half a sandwich I consumed Running went down slow and bad. Heavy. My stomach was churning. I was sweating like crazy. The heat was intense and unrelentless. There was absolutely no shade as we headed south on coastal highway. Three miles post-scrapple and my stomach gave out on me. It could no longer handle the sandwich. I hurled. I hurled hard. Gabe and Brian were more concerned they missed a video opportunity than they were with my state of being. To their surprise and excitement I hurled two more times and they were able to capture the third time on video. It was gnarly and they loved it. That video must never see the light of day. But… I had a clean slate. And we ran on. We filled up our hydration vests at every opportunity, but the ice melted fast in the heat. The ice melting against our backs felt good on the body until the water was too warm to drink comfortably. We cross over the Indian River Inlet Bridge, which ended up being the only elevation gain of our run, and decided this would be a good place to use the public restrooms. By this time we were all 100% soaked from sweating and so we cooled off with the hoses and sinks at the bathhouses. Mile 20. It was now Brian’s choice to pick something to eat. He picked his favorite beach donut location, Griff’s Bethany Beach Bake Shoppe in Bethany Beach, which happens to have the heaviest donuts I’ve had in my life. A blueberry and a sprinkle donut were chosen for me to eat. That was a struggle. These were not light soft donuts they were thick and heavy and I am sure on a normal day they are delicious. The first one I was able to eat fairly quickly, but the second I took on the road with me. It would take two more miles to finish it. Two slow miles. With the donuts behind us we went into autopilot running. There is often a quiet time in a long run where everyone is just focused or numb from the miles. From miles 20 to 26 we pushed through the heat and the sin that was now shinning brightly down on us. We talked about what runners talk about on runs… more runs. Mile 26. We were back at our cars, but Gabe and I were not stopping. Brian had a family commitment to attend to and could venture on with us. However, I did ask him if he was going to run the extra .2 and make it a marathon. His response was classic and something like… “I didn’t come out here to run a marathon”…. and he was off. We still had 50 or 60 blocks to go. We crossed back over coastal highway and ran on the sidewalk since by this time it was middle morning and the tourists were taking over the beaches. 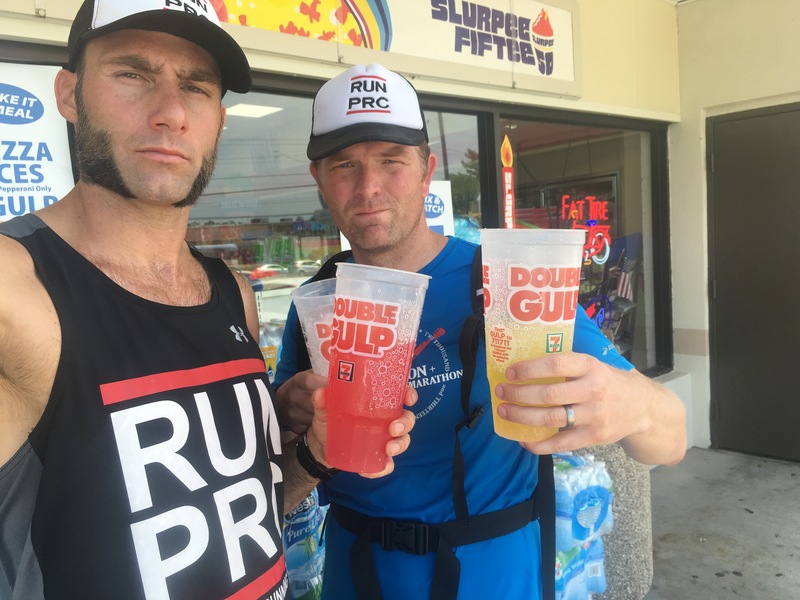 We stopped again to fill up our hydration packs and down a huge soda. I have never in my life consumed so much water in one day. It must have been in the low 90s as we closed on less than five miles to go. My body was getting weak and wasted from the heat, but we continued to talk and laugh and plan further adventures. The mind must be stronger than the body when you hit those dark times of a race. 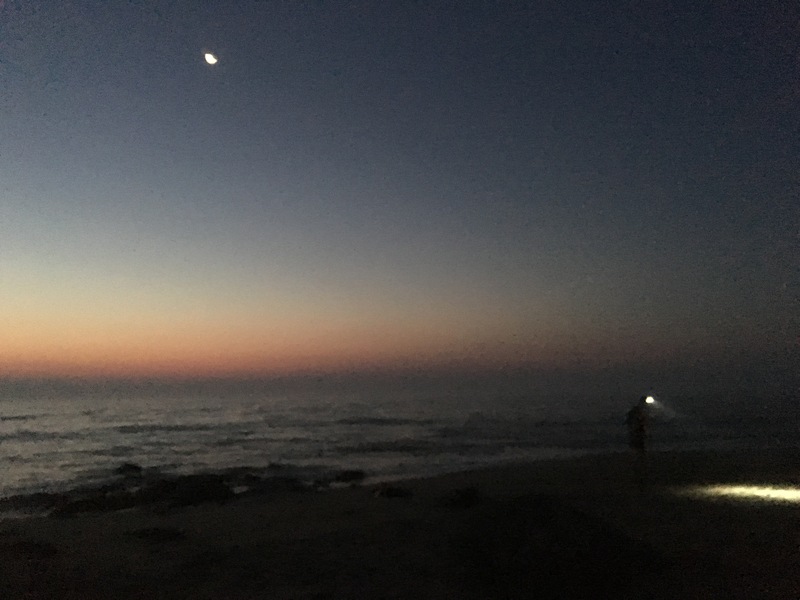 I heard a podcast with an accomplished Ultramarathoner who said that when people really struggle in an ultra endurance they either get angry or upset or they get a little loopy and crazy. We went loopy. I have never stared down a piece of food so long. I ate about as slow I as I ran at this point. My stomach was thrashed. My legs were drained of energy and my body just wanted to sleep and rest. We each ate one slice, which weren’t small! And got out of there. One more mile. Seems easy. Should have been easy, but it was a struggle. 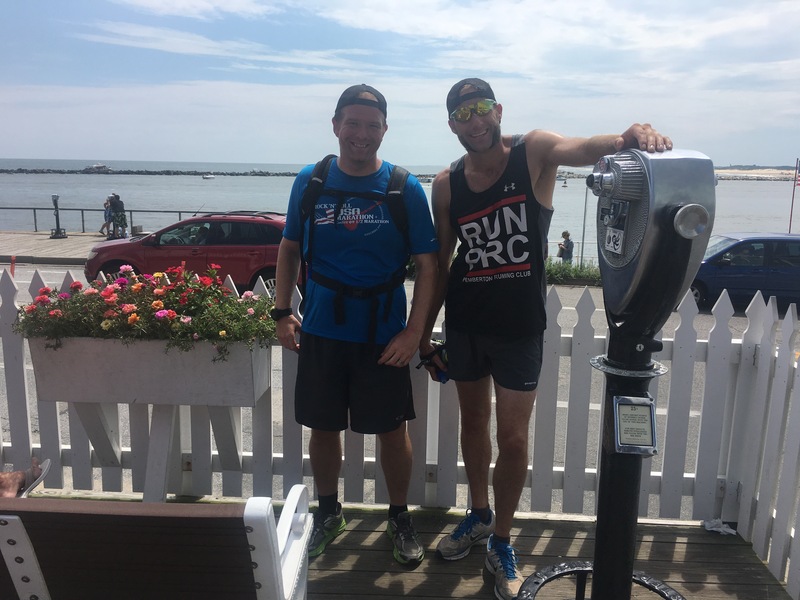 We ran on the boardwalk and weaved between people as we raced toward our goal. Somehow the last half of a mile we picked up the legs and went a little faster. We ran past the skeetball games, past the ice cream shops and past the big fake shark. We touch the white fence at the end of the boardwalk and looked at our watches… 35 miles exactly. We were done. We could see Assateague Island and we knew The Lewes to Ocean City run was a success. The bus ride back to my car was a blur. I was going in and out of sleep as Gabe talked to a few Irish students. He was laughing and talking as if nothing had happened… I bet he could run the entire route again right then. . I drove halfway home pulled over and slept for two hours in a pharmacy parking lot… depleted. Two hour nap in a pharmacy parking lot 15 minutes from your own bed! That’s when you know it was a good day!